Today (7th of July, 2018) marks 40 years of independence for the Solomon Islands. When viewed from the top, the cake will be shaped like a regular five pointed star, just like the ones on the Solomon Islands' flag. To top everything off, there's going to be a miniature flagpole with the flag of Solomon Islands standing smack in the middle of the cake. Now then, as you probably knew (or at least guessed) already, the Solomon Islands were named after King Solomon, the undisputed champion of splitting stuff into equal parts. Each piece should have an equal amount of cake. There shouldn't be any cake left over. Each piece should also have an equal amount of frosting. I'm expecting to cut the cake into seven pieces, but it would be nice if the plan could account for other numbers of pieces too. A most perfect plan would work even if I chose any other regular star as the cake's shape. Can you help me come up with a cake cutting plan worthy of the occasion? This is an adaptation of an age-old puzzle. I decorated it a little for the occasion; hopefully not too much to lose the beautiful point in the original. 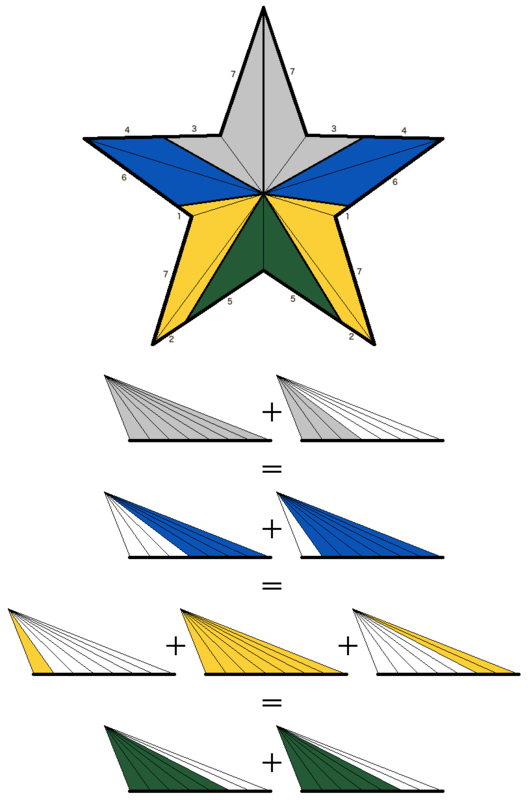 simply divide the perimeter of the star into n equal lengths and cut from those points to the centre. Each part of the perimeter can be seen as the base of a triangle with its apex at the centre of the star. Because of the symmetry of the cake, the heights of these triangles is the same. When you cut the cake into pieces by radial lines from the centre, each piece is made up of such triangles, so their top surface area is proportional to the total length of the bases of these triangles, which is equal to the part of the outer perimeter that the piece covers. For each piece, not only is their top surface frosting area proportional to the outer perimeter used by the piece, so is the volume, as well as the area of the frosting on the side of the piece. (At least to a first approximation, as it ignores the thickness of the frosting. This makes a small difference at the edges of the cake. In a pointy star, the tips of the stars will be all frosting and no cake, so a piece with a tip will actually have a little more frosting than a piece without). 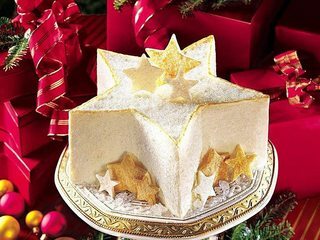 Cut the slices horizontally so that each piece of cake is a thin but complete star pattern. You can cut it into almost any number of pieces (including seven) assuming your cutting skills are good enough. Just make each piece the same height and they all will be equal in volume. Not the answer you're looking for? Browse other questions tagged geometry geography dissection seasonal or ask your own question. How to share this cake?